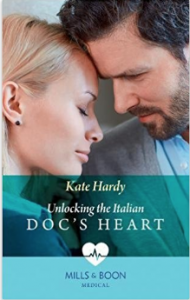 His heart is broken… Will she be the one to heal it? The book is partly set at the Muswell Hill Memorial Hospital’s children’s department, and partly in Italy (Verona and the Lakes). I wrote part of this actually in Verona – where my husband and I went to celebrate our 25th wedding anniversary, so the visit to Juliet’s House and the kiss on the balcony were straight from real life! I also pinched the visit to the bath house in London and the Roman Arena in London from real life (my best friend came to that one). The premise behind the book is that Jenna is so generous-hearted that she was a surrogate mum for her twin – but her partner was completely unsupportive. Renzo, on the other hand, believed that he had a daughter and discovered that he didn’t… So if Jenna lets him close, how will he react when he finds out the truth about her? And can Renzo learn to trust again, with Jenna’s help? You’ll enjoy this book if you like settings of a children’s ward, Italy, and Roman history in London.